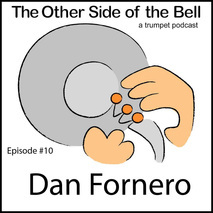 Welcome to the show notes for Episode #10 of The Other Side of the Bell – A Trumpet Podcast. This episode features an interview with studio musician Dan Fornero who joined us to talk about the release of his new album — Not So Old School. Originally from Wisconsin, Dan Fornero first became interested in the trumpet when he joined a local Drum and Bugle Corps, the Kiltie Kadets. He went on to study at the University of North Texas where he played lead in the famed One O’Clock Lab Band. Dan’s professional career includes playing with touring acts such as Woody Herman, Brian Setzer, Tom Jones, and Neil Diamond. Dan was a founding member of the Vine Street Horns, known for their recordings and tours with Phil Collins and French rocker Johnny Hallyday, among others. Dan is a member of Gordon Goodwin’s Big Phat Band and the Bob Mintzer Big Band. Dan Fornero can be heard playing on countless television and movie scores and you can often catch him playing on live television on programs like The Grammys and American Idol. About "Not So Old School"
Playing for years on other musicians’ projects, Dan Fornero decided it was time to create an album of his own. Starting out as a set of basic grooves, Not So Old School pays tribute to many of the funk, rock, and pop stars that have inspired Dan over the years.